Chautauqua Machine Specialties are leaders in full-service engineering, CNC precision machining, manual machining, milling and turning, waterjet, 3D printing, fabrication, and more. Along with manufacturing custom products upon request from our clients, we manufacture two products that are available for purchase. Our quality rating remains at the top in our industry as we are continuously searching for top quality equipment and tooling. Our toolmakers, having pride in their pursuit of superior quality, emphasizes on prevention, allowing Chautauqua Machine Systems to stand out in our field. Chautauqua Machine Specialties manufactures our own branded sprockets specifically designed for the sport of kart racing. 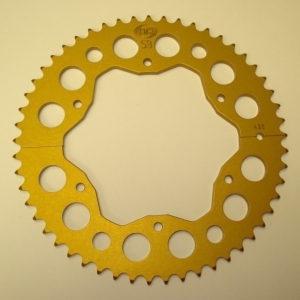 CMS started making these specialty sprockets to improve safety for kart racers. When kart racers started using more powerful engines, and therefore larger chains to increase speed, safety became an issue using the smaller sprockets. Several racers from the Unlimited All-Stars (UAS), a national motorsport organization, expressed an interest in larger sprockets, and CMS answered their call. Chautauqua Machine Specialties became the first manufacturer to make these specialized sprockets for kart racing, and remain one of the few manufacturers in the world which provide these products today. CMS sprockets #420, #428, and #520 are manufactured from 7075 aluminum and hard anodized for endurance. Please visit the Online Store to learn about all the different Sprockets CMS provides. Experience the cost-saving benefits of using the Adjustable Flip Stop, created and patented by Chautauqua Machine Specialties, LLC. Custom sizes are available by special order, contact CMS for more information and start saving today!